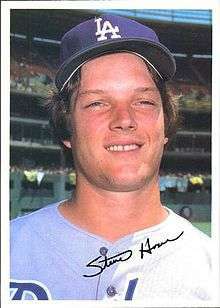 Steven Roy "Steve" Howe (March 10, 1958 – April 28, 2006) was an American professional baseball relief pitcher. He played 12 seasons in Major League Baseball (MLB) for the Los Angeles Dodgers, Minnesota Twins, Texas Rangers and New York Yankees. After briefly pitching for the Minnesota Twins and Texas Rangers and being out of the major leagues for four years, Howe signed with the Yankees, where he once again pitched effectively. However, in 1992, Howe became the second player to be banned from baseball for life because of substance abuse (the first was Ferguson Jenkins, who was also reinstated). He successfully appealed the suspension and re-signed with the Yankees, where he had one final great season in 1994, recording 15 saves and a 1.80 earned run average as the Yankees' closer. He failed to repeat the performance the following year and was relegated to a setup role, and was released in June 1996 after posting an 0–1 record with a 6.35 ERA. Howe finished his career in 1997 playing with the Sioux Falls Canaries of the independent Northern League. ↑ "Autopsy: Howe had meth in system at time of crash - MLB - ESPN". Sports.espn.go.com. 2006-06-28. Retrieved 2011-11-09.